WHITE DIAMOND' produces pure white flowers in the summer. This is a medium sized agapanthus growing up to a metre in height. 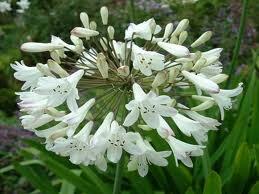 Agapanthus are clump forming and multi-stemmed evergreen perennials, WHITE DIAMOND is also a prolific flowerer. Ideal for any border or large container. The flowers are good for cutting and are followed by decorative seed heads. They grow in fertile, moist, but well-drained ground in full sun. Divide clumps in the spring and cut back any brown or damaged leaves. Protect from heavy frosts.